Congratulations to Dr. Cong Wang, who was selected as one of six recipients of the SME 2014 Outstanding Young Manufacturing Engineer Award. This prestigious award "is conferred in recognition of significant achievements and leadership in the field of manufacturing engineering as a young engineer." Congratulations Cong! Congratulations to Matthew Glazer, who passed his qualifying examination and is now a Ph.D. Candidate! The group bids farewell to Prof. Ranier "Ray" Sepúlveda Ferrer, who has worked with us for the past few months on freeze-casting of Ti and is now returning to the University of Sevilla, Spain. Congratulations on the work you have accomplished during your stay and we'll miss your witty conversation. The group bids farewell to Prof. Paloma Trueba, who has been working with us for several months on freeze-cast Ti foams, and managed to accomplish a great deal in such a short amount of time. We hope to see you again soon! The group bids farewell to Hyungyung Jo, who has been working with us since March, following months. anaged to accomplish a great deal in such a short amount of time. We hope to see you again soon! Welcome to Dr. Cong Wang, our new research associate! Cong comes to us with a wealth of experience in both metallurgical research and as an active member of the international metallurgy community. He will be working on vapor phase processing of Ni-base superalloys for aerospace applications. The group bids farewell to Prof. Noam Eliaz, who has worked with us for the past year and is now returning to Israel to become the founding chair of a new undergraduate Department of Materials Science and Engineering at the University of Tel-Aviv. Congratulations, and best of luck on your new endeavor! Welcome to Prof. Ranier Enrique Sepúlveda Ferrer and Prof. Paloma Trueba, from the University of Sevilla, Spain. They will be working with us at NU on freeze-cast Ti with graded porosity. 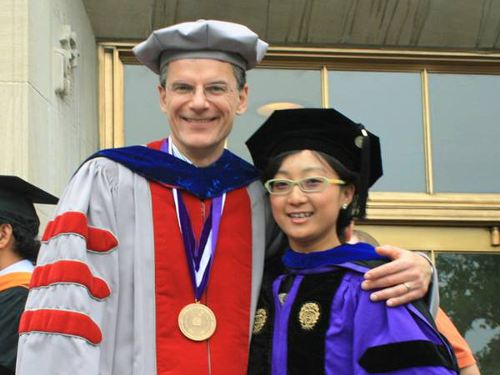 Congratulations to Peiqi Zheng, who defended her Ph.D. thesis this spring and will go on to begin her career at Stryker working on research for biomedical applications! 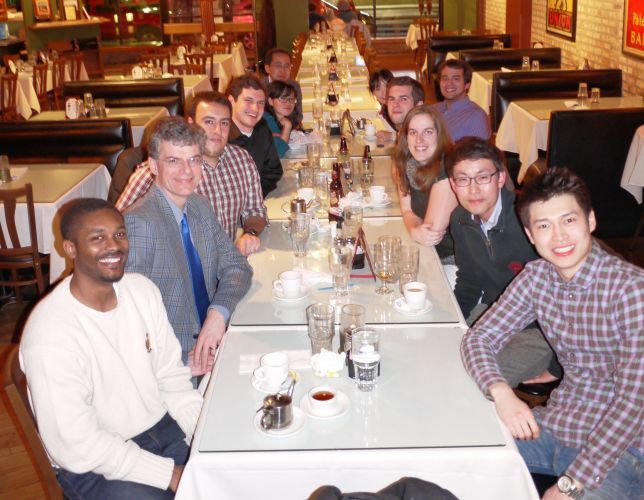 The group held a farewell dinner for Myounggeun Choi, who has been working with us for the past six months. We also bid welcome to Hyungyung Jo, who will be working where Myounggeun left off. Both Myounggeun and Hyungyung are students at Kookmin University under Prof. Heeman Choe (a former postdoc in the group), who also joined us for the occasion. Welcome to Dr. Liqiang Wang, an assistant professor at Shanghai Jiaotong University, who will be working with us at NU.